Fudgy Gluten Free Brownies are my first brownies without gluten and they came out amazingly yummy. They were as good as Fudgy Apple Brownies and I can tell you that nobody can understand that these are gluten free unless they are not told. Nobody has celiac disease in our family, yet I try to develop gluten free recipes for my friends and readers with that disease. Also, I want to taste gluten-free foods myself to have an undestanding of their feeling, so I’ve made several gluten free dishes so far. If you are curious about more recipes for people with celiac, you can find them at Gluten Free category. 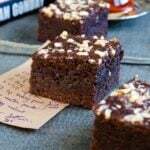 I’m really happy to say that these Fudgy Gluten Free Brownies are so good that you should try these even if you don’t have to follow a gluten free diet. They are so moist and fudgy, just how I love brownies. Everyone gobbled them up without knowing that they were gluten-free. They were so surprised when they learnt it and asked for the recipe. Unlike most of the gluten free brownies on the web, these Fudgy Gluten Free Brownies don’t have black beans or avocado or special kind of flour. I just used rice flour and a little corn starch and the result is exactly the same as regular chocolate brownies. These are rich and velvety and they wonderfully satisfy your chocolate cravings. I’m sure yogurt and olive oil in these Fudgy Gluten Free Brownies have a role in this perfect moistness. These two help the brownies go into the healthy recipe list, which is another reason to bake them for everyone. 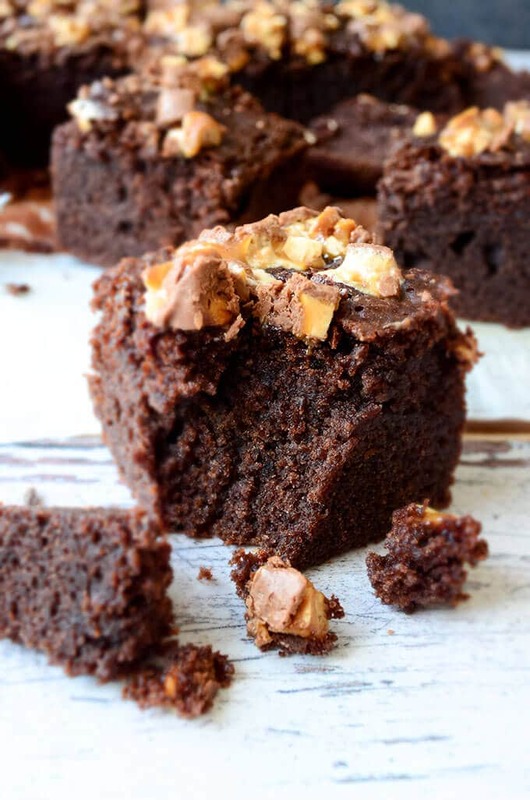 Chocolate is good, so why not double the taste of chocolate by topping these already super yummy brownies with chopped snickers? This step is optional, but highly recommended. I placed them on the brownies when they are baked. I just took the pan out, top the brownies with snickers and put it back in the oven and wait it there until snickers start to melt, for 5-7 minutes. Make sure the oven is not working, snickers will almost melt with the heat inside the oven. And the brownies will set better during this time. Fudgy brownies with rice flour, corn starch, yogurt and olive oil. Grease a 9×13 inch baking pan and line with parchment paper. Whisk eggs and sugar until creamy. Add in yogurt and olive oil. In a separate bowl whisk together rice flour, corn starch, baking powder, vanilla powder, cocoa powder and salt. Gradually pour dry mixture into the wet mixture. Stir just until combined. Bak efor 35-40 minutes or until a toothpick comes out clean. Take it out from oven and top with chopped snickers. Put it back into the oven. Make sure the oven is not working. Snickers will almost melt with the heat inside. Wait it there 5-7 minutes or until snickers start to stick on the top of brownies. Oh didn’t know that. Thanks Allie! I tried the recipe. Unfortunately it disappointed. The olive oil is too bitter and really comes through. You might try it with coconut oil? Just a suggestion. Hi Cathrine! Sorry to hear that. The quality or type of olive oil might make a difference. If you find its taste too strong, I think coconut oil works fine too. These brownies looks SO chocolaty, fudgy and delicious. Definitely craving one to devour right now… great recipe!